13 May - 15 September. 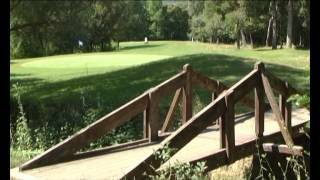 Close to the Route des Alpes and the Gorges du Verdon, le Domaine du Verdon is a large, level site, part meadow, part wooded with an attractive range of planting. There are 500 partly shaded, rather stony pitches (390 for touring units), 360 with 16A electricity and 125 also with water and drainage. Numbered and separated by bushes, they vary in size and are mostly separate from 60 mobile homes and pitches used by tour operators. Some overlook the unfenced Verdon river, so watch your children. This is a very popular holiday area, the gorge and the associated canoeing and rafting being the main attractions. Two heated pools and numerous on-site activities during high season help to keep non-canoeists here. This site is ideal for active families. One can walk to Castellane without using the main road where there are numerous shops, cafés and restaurants. Dances and discos in July and August suit all age groups. The latest finishing time is around 23.00, after which time patrols make sure that the site is quiet. The site is popular and very busy in July and August. Refurbished toilet blocks include facilities for disabled visitors. Washing machines and dryers. Fridge hire. Motorhome services. Babysitting service. Supermarket. Restaurant, terrace, log fire for cooler evenings. Pizzeria/crêperie. Takeaway. Heated swimming pools, paddling pool with fountain. All amenities are open all season. Fitness equipment. Organised entertainment (July/Aug). Play areas. Minigolf. Archery. Organised walks. Bicycle hire. Riding. Small fishing lake. Room for games and TV. Internet access. Communal barbecue (charcoal not permitted on pitches). WiFi in some parts (free). 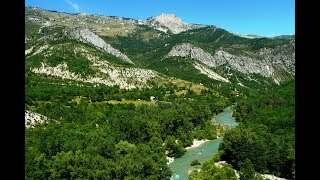 From Castellane take D952 westwards towards Gorges du Verdon and Moustiers. Site is 1 km. on left. 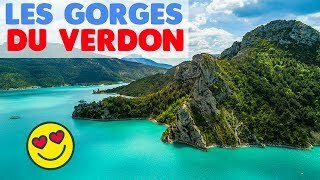 Découvrez les Gorges du Verdon !